I’ve been making these recipes for years. I originally found them in AMISH & MENNONITE KITCHEN (1995). 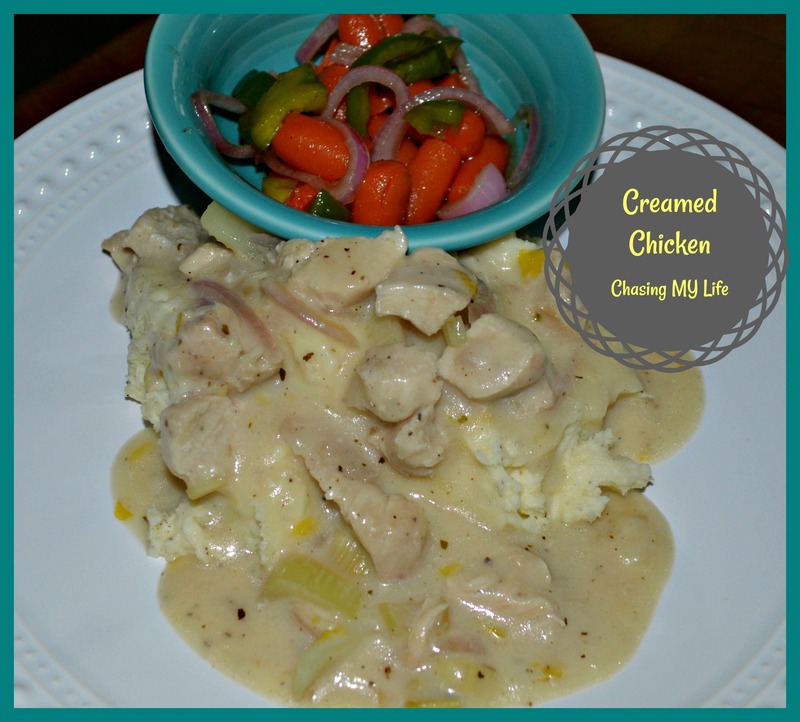 The Creamed chicken works as a comfort food that is satisfying and rib sticking too. I made a few “small” changes over the years to add some additional flavor. It can be made quickly and easily on a week night. 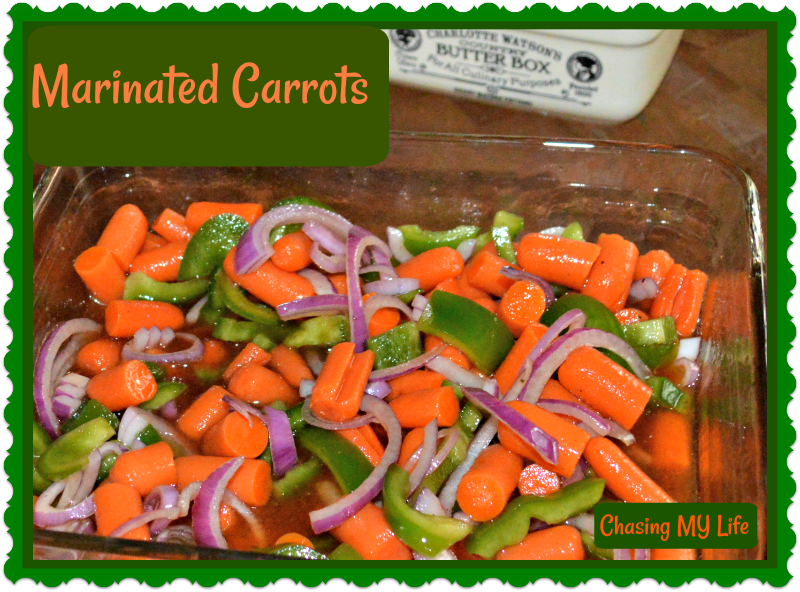 The marinated carrots add tons of color and a bit of acidic tang too. You just have to plan ahead on the carrots since this recipe requires marinating and chilling overnight. I’ve included my next best marinated carrot salad recipe (given to me by a very sweet old lady) that I’ve been using since the 80’s. Both recipes keep well in the fridge and taste better several days later. The cookbook called for the creamed chicken to be served over “FLOATING ISLANDS”. I tried making them twice, but they were VERY bland and terribly horribly full of fat and cholesterol. In a large skillet melt ghee. Add flour, salt, pepper and celery leaves, stirring until smooth. Add milk and chicken broth, stirring to blend. Bring to a SLOW boil and and boil slowly for 5 minutes, stirring constantly. Add chicken pieces and heat through. Serve over toast, wide egg noodles or mashed potatoes. NOTE: *I use rotisserie chicken quite often, but usually just brown and shred 2 skinless, boneless chicken breasts. Add carrots cooking JUST until softened. DRAIN. In a large mixing bowl toss together the carrots, onion rings and bell pepper slices. In another mixing bowl whisk together remaining ingredients and pour over vegetables. Whisk together soup, salad oil, Worcestershire sauce, sugar, salt and pepper. 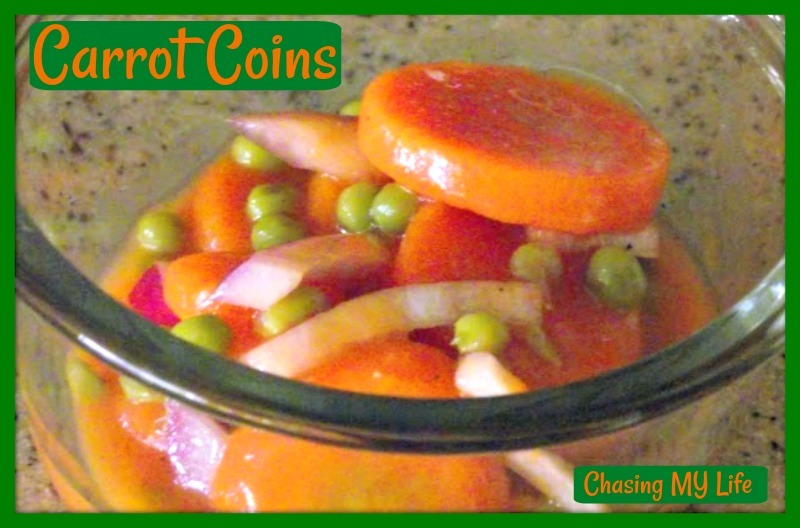 Add carrots, peas and onions. Chill overnight so flavors blend. dash each of garlic salt, onion salt, basil, and oregano. Whisk in flour and seasonings and cook until bubbly. Add tomato puree’ and blend well. Remove from heat and gradually whisk in liquid. Return to heat and cook, stirring, until smooth and thickened to desired consistency.